Part of our jobs as marketers is helping find the right vehicle for our client’s message. Patrick County, Virginia is an outdoor recreational gem of a destination. 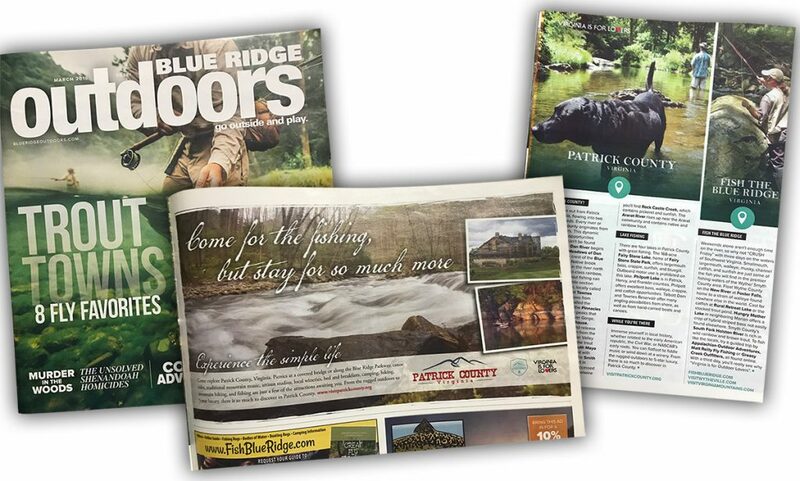 What better place for people to learn more about the county than in Blue Ridge Outdoors magazine? We have a consistent run in the magazine and will tailor ads based on the content within each issue. The March 2018 magazine is their Fishing issue and Patrick County has some great fishing opportunities for visitors as well as locals. Between the creeks and rivers that rise up within the county and the lakes, there are wonderful choices like fishing from the bank, wading, floating, and boating. We created a half-page ad to run focusing on fishing in the area and also wrote a 300-word advertorial about the types of fishing and different fish species that are prevalent in the area. Now, it’s time for us to get out there and enjoy it!